Judging from the attendance at major football matches in the country, interest in the local version of the sport is at an all-time low. And, yet, there was a time when club games throughout the country drew huge crowds. So, clearly, there has been a major falling-off during the life of the present administration, even as more Trinidadians than ever are playing in some of the major leagues abroad. The primary duty of any national organisation is to widen the base of participation. So the onus is on the Trinidad and Tobago Football Federation (T&TFF), not only to find ways to bring back the crowds, but to get more youngsters into the sport even as it faces competition, both from sports that are relatively new to these parts and other recreational activity now occupying people’s leisure time. It is with great interest, therefore, that we await the public release of the national football development plan that has been prepared by the T&TFF’s special technical adviser, Alvin Corneal, technical director Richard Braithwaithe and Concacaf development officer Keith Look Loy. The assumption here, of course, is that the plan will not be viewed as a document for the private edification of the T&TFF’s officials, but will be made available for public discussion and comment. That is obvious. What may not be so obvious, however, is the need to bring the public on-side with the plan’s broad parameters, if not the details, since it is tax-payers’ money, both in the personal tax that they actually pay and the percentage of the national patrimony, that is devolved to the T&TFF. 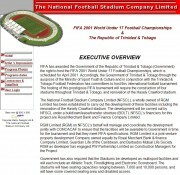 What we also find interesting, given the history of both the T&TFF and its earlier incarnation, the Trinidad and Tobago Football Association (T&TFA), is that Mr Corneal should have found it necessary to publicly insist that the talented professionals recruited to implement the plan be given autonomy since that was “absolutely essential” if the plan was to be successfully carried out.